Focused on the ever-changing workplace of today, where a physical office location is not certain, RingCentral Meetings entices with a wide range of features such as 24/7 phone support, team messaging, single sign-on and a unique “Call Me” function, assuming you’re willing to shell out for one of the non-free options. Be that as it may, its value is undercut by the fact that Zoom costs the same and exhibits more. Though it’s primarily recognized as the global provider of cloud-hosted VoIP service RingCentral Office, RingCentral is a busy company, and so it’s also involved in the equally important video conferencing market. Because 37 percent of workers in the United States have telecommuted, according to the Gallup annual work and education poll, it’s become increasingly vital for remote employment to become just as effective as “going” to work in an office. Research groups suggest that, by 2022, 60 percent of the employees that now have to work at a designated location will be commuting from their beds to the chairs under their at-home office desks. Clearly there are a number of benefits to working from home. It saves companies money, as they never have to cover the travel expenses of their subordinates, and perhaps more relevant to our current social climate, workplace conduct is likely to remain professional since no one ever has to see their colleagues in person. Everyone wins. Well, sort of. The problem is that there is no ideal way to 100 percent emulate face-to-face conversation over the phone or on a computer screen. As much as we enjoy spamming memes in our various Slack channels, that’s more of a detriment to productivity than an enhancement. 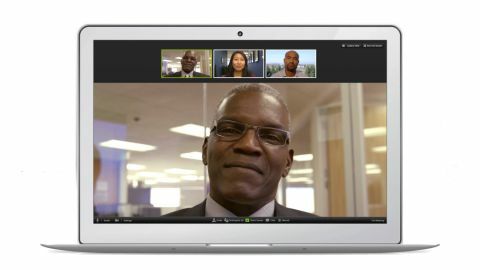 That said, the aim of RingCentral Meetings isn’t to replace real-life conversations altogether, but to offer the next best thing – a video conferencing platform for those who don’t have the luxury of conferencing in the flesh. RingCentral Meetings starts at the unbeatable price of free, and gives you a generous helping of features that you never have to pay a dime for. At its most expensive, it’s still rather affordable, even if what you get for that cost is not as impressive as what some of its competitors bring to the table. Then again, by subscribing to RingCentral Meetings, you’re silently committing to a give-and-take agreement in which you have to compromise in some areas while reaping exclusive benefits in others. RingCentral Meetings, unlike some of the other video conferencing suites we’ve reviewed like Zoom and Cisco WebEx, has three different flavors – we mean pricing tiers – that you can choose from. They go by the names of Free, Essentials and Advanced, and they’re all about as straightforward as they sound, save for one feature in particular, dubbed Call Me, that will necessitate a thorough explanation later on. In the meantime, let’s talk about what each plan promises and how much they all will cost you and your business. The Free plan of RingCentral Meetings, as its name suggests, is free. You don’t have to pay for this service. All you have to do is sign up with an email address, or a phone number, and a password and you can video conference to your heart’s desire. With limitations, of course. Since RingCentral would rather you pay out for its services, the limitations of RingCentral Meetings Free are strict, but not as strict as we expected given its nominal price. Intended “for agile teams,” according to RingCentral, RingCentral Meetings Free may very well do the trick for some smaller organizations. With the RingCentral Meetings Free plan, you can count on having access to all the basic components of a video conferencing program. These consist of screen and application sharing between hosts and participants, including simultaneous screen casting, collaborative whiteboarding and in-meeting group chats as well as private chatting, so you can talk smack about your boss while they’re in the midst of presenting. Moreover, with RingCentral Meetings Free, you can look forward to real-time annotations, team messaging and collaboration, Outlook integration for one-click scheduling, the ability to join meetings from virtually any device (a la WebEx), local MP4 and M4A recording and the same HTTPS and SSL security that you get with the paid RingCentral Meetings options. RingCentral Free supports up to 100 participants at a time and unlimited one-on-one meetings, however group meetings are limited to 40 minutes each. The next step up from the Free rendition of RingCentral Meetings is the Essentials plan, which costs $14.99 (£11.74) per month, the same as Zoom Pro. RingCentral Essentials comes with everything included with RingCentral Free, but group meetings are unlimited rather than being confined to 40-minute segments. You also get 24/7 phone support, which is a lot more clear than the “business hours only” phone support that WebEx delivers with its $17.95 (£14.12) Plus plan. Additionally, RingCentral Meetings Essentials nets you basic reporting, single sign-on (SSO) and a handful of advanced team messaging and collaboration features. It has a 1,000 Call Me minutes, too, which basically means you can seamlessly switch call audio to your phone without having to dial in yourself – instead, the services calls you. Unfortunately, Call Me is disabled by default and, to activate it, you will have to contact RingCentral customer support. Last but not least, RingCentral Meetings Advanced costs $19.99 (£15.68), and supplementing everything we already discussed with the Essentials plan, subscribing to the Advanced plan adds a dashboard with real-time reporting and an available service level agreement (SLA). Plus you get 2,500 Call Me minutes. In our experience, RingCentral Meetings is tough to distinguish from the aforementioned Zoom video conferencing software. The main differences are in the non-free tiers, where Zoom packs a lot more features into the same pricing. So if you’re going to pay between $14.99 (£11.74) a month and $19.99 (£15.68) a month anyway, you might as well opt for the service that gives you a vanity URL with company branding, custom emails, unlimited cloud storage, LTI integration and more features that are notably absent from RingCentral Meetings. Otherwise, apart from the fact that its competition showcases more at the same cost, RingCentral is a decent service.